We have found that flashy design and enticing offers don’t always produce great results. That is why we test each and every campaign before we sell it to you. Once a piece is proven to work, we share it with you. This gives us much more consistent and predictable results. Without question mailing patients or inactive patients will generate the highest response rates. In some situations, the response rate can be 4-7 times greater than a prospect mailing. Once you are mailing to your patients 4-6 times per year we suggest mailing to the most viable prospects based on your Market Analysis. That way you can be assured you are targeting those most likely to respond. 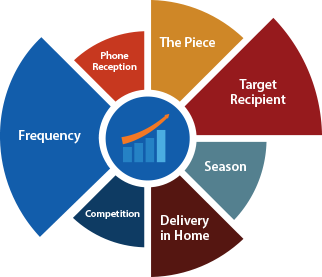 If you are interested in mailing prospects, make sure to ask a BlueWing Account Executive how they can provide you with a custom Market Analysis. While the design, offer and message of the direct mail piece are very important; there are other factors that significantly impact the success or failure of any campaign. For instance, it is also important to pay close attention to who you are mailing to and how often you are mailing them, the effectiveness of your staff handling inbound calls, the day the mail is delivered and other offers in the marketplace from your competition. One fact about direct mail is the more you mail to an individual, the more likely they are to respond. 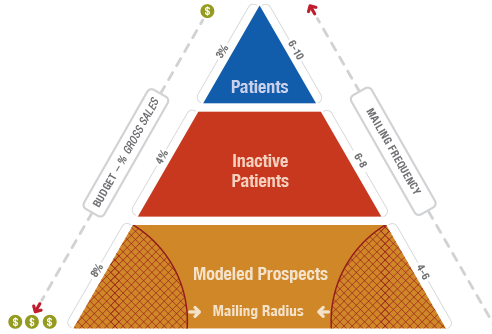 So simply, as indicated in the diagram below, we suggest mailing to patients at least 4 times per year before spending any money on prospect mailing.